Please bring something for STEP: brown paper grocery bags, food or clothing. This is a chance to connect with other Asset Champions. City Open House – Volunteers are needed for the Children First table at the City Open House on Tuesday, June 9, 5:30 – 8:30 p.m. at the Rec Center. If you can help email Karen. Above is STEP’s photo for the poster painted by three sisters. Greta, 8 years, has been volunteering in the STEP food shelf for 2 1/2 years. Audrey, 6 years and Fiona, 4 years, help out in the STEP warehouse once a month. 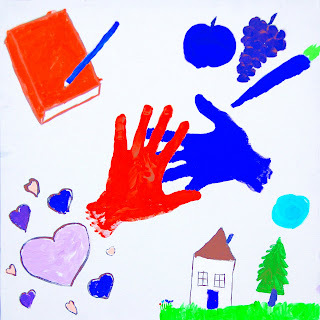 The inspiration for the painting was showing “helping hands” and painting what they wished everybody in the world would have: love, a home, good food, and education.